Home » Markets & Stocks » Is The S&P 500 Chart A Reflection of Mr. Trump’s Style, And How May This Resolve? Is The S&P 500 Chart A Reflection of Mr. Trump’s Style, And How May This Resolve? This year, 2018, is characterized by being a choppy year for stock markets, especially in the U.S. If we look very well we almost see the S&P 500 (SPY) reflecting the style of Mr. Trump. But, on a more serious note, we are looking at a potentially very bullish outcome, supporting our 5 Top Stocks Forecasts for 2019 to materialize, here is why. The chart of the S&P 500 reflects an interesting pattern. It is almost as if it reflects the style that Mr. Trump applies in his role as President. When Mr. Trump was elected there was a panic sell-off which only lasted a couple of days. The S&P 500 quickly recovered and went up sharply. When Mr. Trump was inaugurated there was a similar sell-off which got followed by a sharp and fast recovery. This all feels like the style of Mr. Trump. Note, this is a factual observation, not a criticism or anything else. Fast forward to this year where we see a similar evolution. First there is a sharp sell-off which got introduced by talks of a trade war. It was more threats than anything else. Now, after a second sell-off this year, we see a recovery that is starting to shape up at a time when the president says he wants to talk with China. The above was more of an anecdotal viewpoint, by drawing the similarity between the style of Mr. Trump (vicious but short-lived) followed by good things. On a more serious note the S&P 500 seems to be shaping up in a very bullish way. 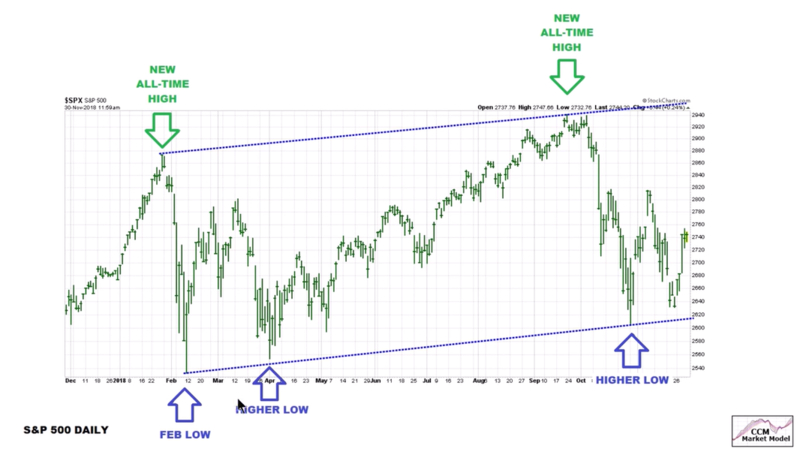 Courtesy of market analyst Chris Ciovacco who has a weekly S&P 500 market video which we can really recommend we see an interesting pattern shaping up. Below is the S&P 500 pattern for 2018 with, interestingly, a series of higher highs as well as higher lows. We strongly recommend to listen to the top notch analysis of Mr. Ciovacco of this weekend’s video (which we have embedded below) as he shows very useful viewpoints. Note that we come the same conclusion as Mr. Ciovacco but we are looking from a totally different angle. As said before we strongly believed, and continue to believe, that markets arrived at a Major Turning Point With End Of 40-Year Bull Market In Bonds. Obviously, such an important event will have major implications, and a temporary period of turmoil may certainly be perfectly normal. We see that the stock market may be winning this battle now, with a successful backtest of the lows, and that the bond market will lose this game. 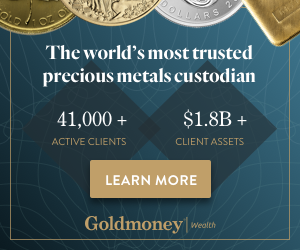 Moreover, with talks by the Fed to slow down rate hikes, as per FT, we believe this scenario may result in a strong boost in commodity prices, especially gold and silver and uranium stocks may do very well in the next 3 months. Stay tuned, as it is about to get very interesting in markets now!